Naik Naik & Company has enhanced the Equity stake of their present Equity Partners Abhishek Kale and Madhu Gadodia in recognition of their impeccable service delivery and robust commitment towards the growth of the firm. The firm has also promoted Associate Partners Abha Shah and Radhika Iyer as Equity Partners in the Firm. 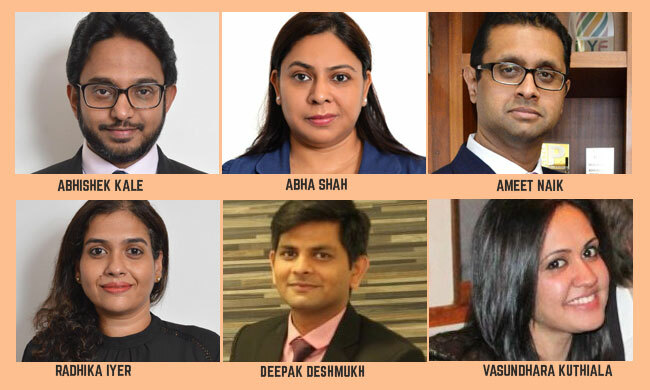 At the Associate Partner level, the firm has promoted Principal Associate Deepak Deshmukh and has on-boarded Vasundhara Kuthiala, former Head (Legal & Content), DoIT Talent Ventures (India) Pvt. Ltd.
Abha Shah has been at the forefront of the Media & Entertainment practice of the Firm; and is the focal point of all non-contentious work in this sector. Her work area also covers the entire horizon of the Intellectual Property practice. Radhika Iyer, on the other hand, joined the Firm in 2016 to spearhead the General Corporate & Commercial Advisory practice at the Firm. She has added a gamut of offerings in commercial laws and corporate advisory including mergers & acquisitions, private equity and all cross-border transactional work, bringing gravitas to the corporate practice at the Firm. Newly promoted Associate Partner Deepak Deshmukh has played a pivotal role in handling litigation and International Arbitration matters. The Firm also welcomes Vasundhara Kuthiala as an Associate Partner. Having managed legal contract and allied solution services suite for the media and entertainment domain at Bimal Parekh & Co.; and with experience of working as in-house counsel at DoIT Talent Ventures (India) Private Limited and KWAN, she will add a new dimension to the Media & Entertainment practice. Ameet Naik, Founding & Managing Partner of Naik Naik & Co. shares, "I am a staunch believer in an 'inclusive growth model', acknowledging the contribution of my Partners & team members, and empowering them to take up leadership roles in the Firm. We are a collaborative force and we will continue be the flag-bearers of innovation in the legal space." Bithika Anand, Founder & CEO, of Legal League Consulting, and Nipun Bhatia, VP – Strategic Management & Process Redesigning, helped the firm in Partnership Structuring and Compensation Modelling.